It’s early evening by the time we reach the last stop, #5, on our 19th-century walking tour, where a long line of mostly men, engaged in several sotto voce conversations, are waiting to enter the Odd Fellows Hall at 1205 Second Street. Snohomish Lodge, No. 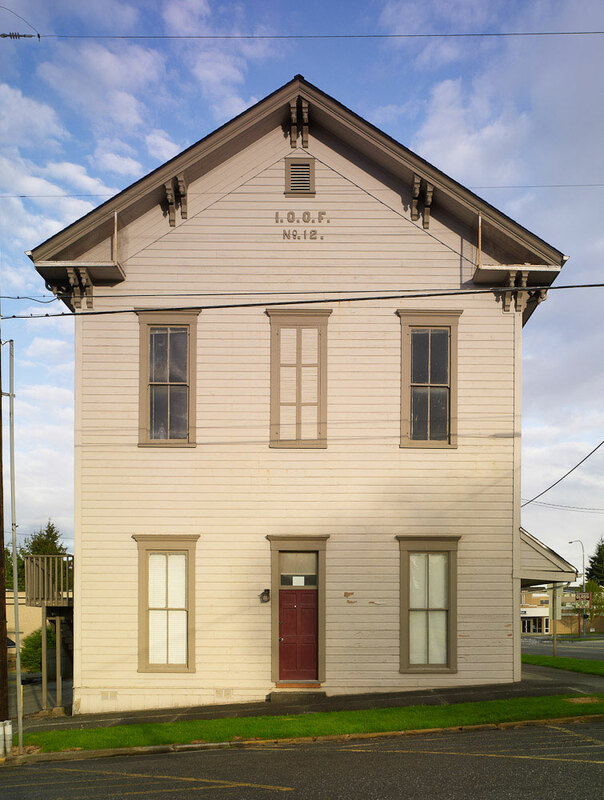 12, of the I.O.O.F was dedicated on April 20th, 1886, in an elaborate ceremony presided by Grand Master G. D. Hill, of Seattle, that included Lodges of the Order in the Territory, as well as the general public. 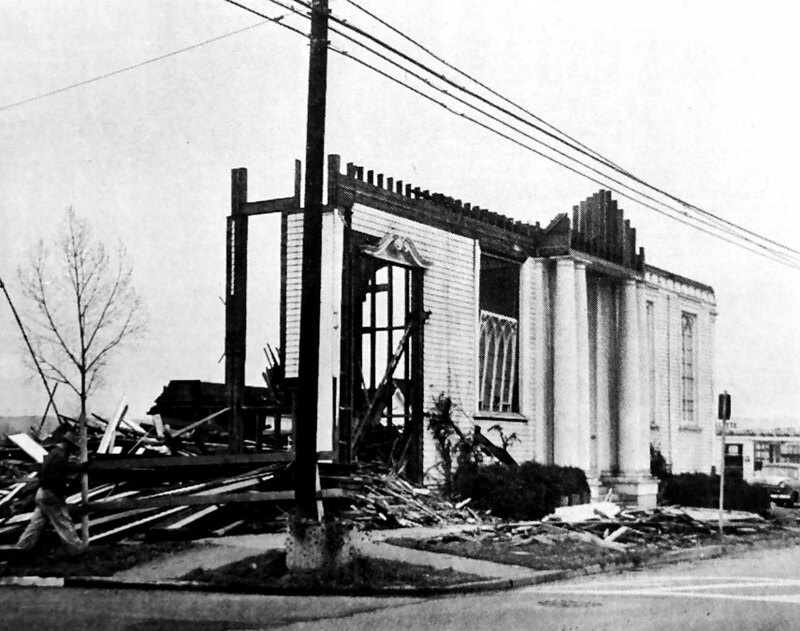 The ceremony was followed by a grand ball at the Atheneum Hall, First and Avenue D.
Referred to as the Odd Fellows Hall in the newspapers, the handsome facility, built by J. S. White, immediately filled the need for a community meeting place for a growing Snohomish. For example, there was a huge turnout for the railroad meeting held in the hall on Friday, December 15, 1887, about bringing the Seattle, Lake Shore and Eastern Railway into town — a meeting that I wrote about in March 2010. The “Snohomish Choral Society” meet there on a regular basis, charging ladies 10 cents and gentlemen 15. With a name whose meaning has been lost in translation over the years, the “Wranglers Society” offered a mix of song and debate. The “Free Thought Society” met to organize its upcoming schedule of lectures in 1889: State Constitution, Weatlh and Want, Evolution and Religion — but put off forming a committee for music. 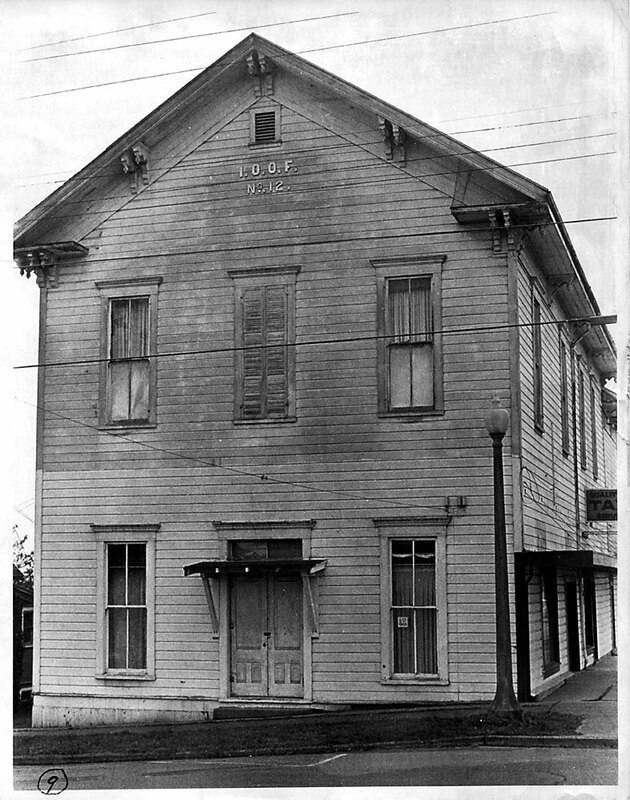 The Odd Fellows Hall was the scene of many contentious gatherings beginning in 1887, over the tandem subjects of statehood and incorporation, covered in juicy detail by the two newspapers, “The Eye” and “The Sun” — each with an editorial stake in the outcome of the discussions. Let’s imagine it’s Friday, April 25, 1890, the issue of incorporation is coming to an head as the crowd gathered on Second Street is waiting to hear Hon. Sam H. Piles, a lawyer who got his start in Snohomish and has returned as Seattle’s city attorney. 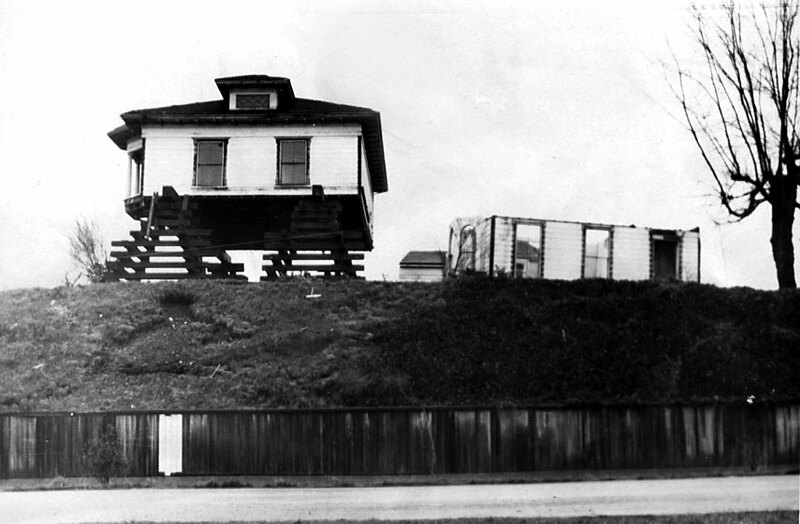 The expectation is that Piles will speak in support of the opposition to the wishes of Snohomish’s Founding Father, E. C. Ferguson, on the question of re-incorporation as the City of Snohomish in the new state of Washington. The doors are opening now and the charged crowd quickly disappears to find a seat in the large, open room on the second floor — a room that remains essentially unchanged over the years. Of all the wonderful historic structures in Snohomish, I would select this room if I had one wish to make the walls talk. 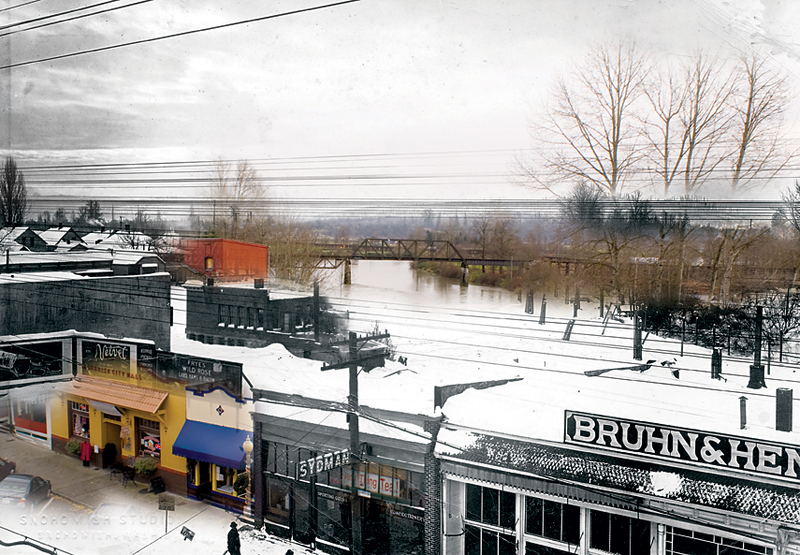 You are invited to read the fascinating story of Snohomish’s re-incorporation as a City of the third class at HistoryLink.org. Published in the Snohomish County Tribune, November 21, 2012. This entry was posted in Posts and tagged E. C. Ferguson, incorporation, odd fellows hall, Snohomish WA history on November 20, 2012 by warner. Leaving the Getchell House at 1122 Second Street to continue our imaginary 19th-century walking tour, we would most likely follow our nose to Knapp and Hinkley’s Livery next door (#3). Owners Sewell M. Knapp and Elwin B. Hinkley were in business when the first insurance maps of Snohomish were published in 1888. Cyrus H. Knapp was the first cousin to Sewell and we assume a business partner since he is identified in the historic image as the man on the extreme right. 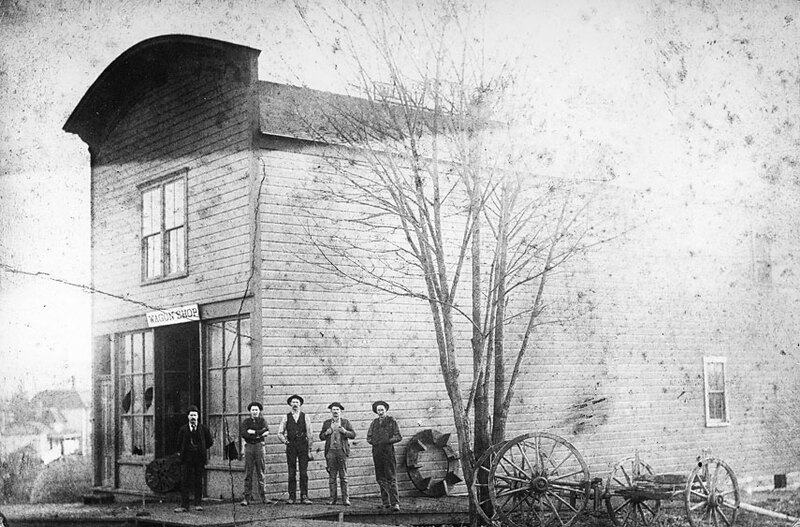 Cyrus was an active participant in the civic affairs of early Snohomish, serving as a council member in 1891, and on the committee to establish a fire department. This may explain why The Eye would describe his wagon shop as the place for catching up on the town gossip. On January 30, 1892, The Eye reported a hilarious story “The Porker Escapes” that has been published in River Reflections, Part II on page 152. The short version is that Councilman Knapp joined Mayor Ferguson and Marshall Cleveland in pursuit of a large pig running loose on Second Street. Just as the men, joined by two schoolboys, had the rebellious beast cornered, it insisted on paying a visit to the Presbyterian church on Avenue A, (where our Then-and-Now tour began in July). This badly faded print is the only one we have of this popular early Snohomish business, often mentioned in the local newspaper The Eye. As if to make up for the poor condition of the photograph, the names of the men posing for the camera are listed on the reverse. From the left, A. C. Carpenter, L.A. Carter, Ora C. Knapp, Pat Coffee, and Cyrus H. Knapp. Thanks to Ann Tuohy and David Dilgard, Northwest Room, Everett Public Library for research help on this story. Published in the Snohomish County Tribune, September 19, 2012. 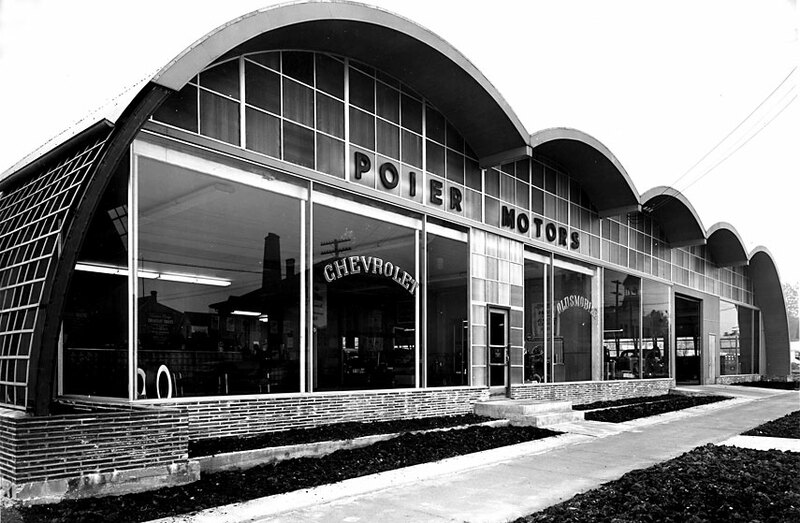 This entry was posted in Posts and tagged Snohomish WA history on September 18, 2012 by warner.